Here's the short version: for about a year, I've set a personal alarm every day at 12:34 PM. In that time, I set aside a few seconds to think about something for which I'm grateful, or I just try to appreciate the moment I find myself in. For 2016, Allison and I have committed to post our thoughts, alternating daily, on our blog, hoping to grow a sense of mindfulness and appreciation in our lives and home. We invite you to join us in comments here, in your own writing, or on social media. To share in your experiences and to allow you to share ours, we're suggesting the hashtag #twelvethirtyfour . Now the longer explanation. My goal for this post is to explain the idea, and to extend an invitation to join Allison and me as we try to deliberately meditate on and record our reflections and daily gratitudes. Like a lot of ideas I've had, I don't know exactly where the idea for 12:34 originated. "Mindfulness" has been an increasingly prevalent idea in a lot of writing and thought within my sphere of culture for the last couple of years. I'm sure that environment has had a significant impact on the idea that has become a daily moment of reflection. Since my dad died in 2009, I've tried to be mindful of the preciousness and significance of life. I didn't have a method, but a vague commitment that I should be more aware of time that I too often let slide by unnoticed. Becoming a runner and committing to be physically active were extensions of that for me. Then Allison was diagnosed in February 2013, and I found my capacity for gratitude squeezed out by fear and a bitterness from which I had previously been free. My time between deliberate meditations grew, and I was more focused on reining in a kind of existential dread than anything else. As Allison's treatment proceeded and her recovery gained momentum, I found a renewed interest in regular reflection. (Being surrounded by our beautiful, hilarious children didn't hurt, either). I don't remember when I programmed a daily 12:34 alarm into my fitbit. I use a fitbit, and have used it in lieu of a clock alarm for work since 2014. One day, while double-checking my alarm, I had the idea to use it to remind me to take a deep breath, think, and observe. I've always liked numbers (I count stairs and have an affinity for primes and perfect numbers, for example). 12:34 was pleasing to me because of its sequential, logical nature. It was also a time when I knew I wouldn't be actively teaching a class at school, and would almost always have a few seconds to think. I don't remember the date when I set my recurring alarm, but I remember when I shared the idea for the first time. I remember because part of me was worried how the idea would be received. I hadn't meant to keep it a secret, but I definitely didn't talk to anyone about it for the first few months. Was it too corny? Was I in danger of putting a Walden Pond sticker on my Volvo? Was I becoming the hokey old person who spoke in platitudes and was humored by his more realistic friends? Our friend Caleb was the one who nonchalantly asked about it last summer in Maine. 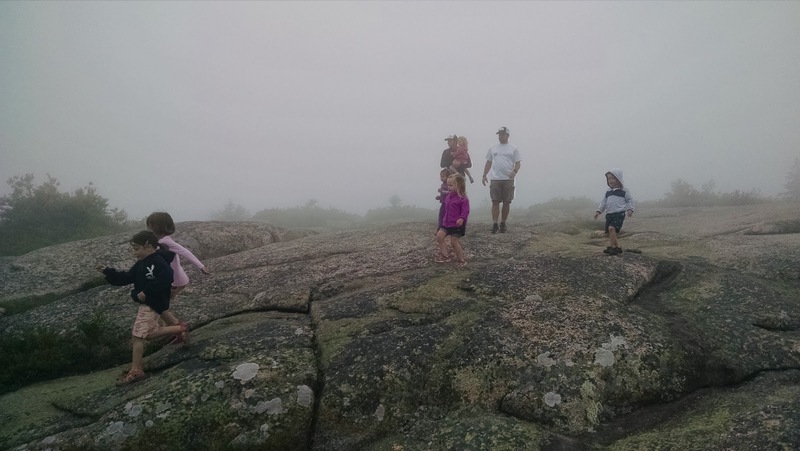 Our friends' families had been walking around on top of Cadillac Mountain in Maine in a heavy fog. The views should have been spectacular, but visibility was less than a quarter of a mile. The kids ate wild blueberries, and we took foggy pictures and looked at signs explaining the invisible views far below. Caleb and I were buying passes in the welcome center when my 12:34 alarm vibrated. He asked what that was for and, caught off guard, I said something like, "Just a little reminder I do every day." When we got back to the car, I explained it completely. I realized that my gratitude that day was for being with friends whom I love, navigating the fog together, and laughing at the irony of Google Street View providing better views of our surroundings than we ourselves had. That night, around a campfire, Caleb asked everyone in the circle to name something for which they were thankful. If it were anyone but Caleb, it might have been dismissed as a cheesy icebreaker. But Caleb has a gift for encouraging earnest sincerity from people. To start it off, he mentioned having a friend who dedicated daily time to reflection, and that he was thankful for a friend like that. Everyone shared something one at a time, clockwise around the circle. When it was my turn, I outed myself as that friend that had started the whole discussion, and found myself talking into the fire for a longer time than I expected. I talked about my dad, and Allison, and about my hope to be deliberate in the way I live my life. Other friends around the fire were and had been navigating joys and sadness like mine, and continue to do so. My answer that night, and on many days since, has been that I'm thankful for my friends who encourage, support, and love without condition. A few months later, Allison and I were out on a date, and found ourselves talking about 12:34. We talked about the idea of sharing the experience and setting time apart each day. We did that through the end of last year, and took the extra step of committing to document it on our blog, starting January 1 this year. I find that I like it especially when Allison and I are together at 12:34 because I know we're each taking a second in the same physical place to contemplate it in differently meaningful ways. I would love to think that other people are sharing similar moments with us at the same time. For me, sometimes those thoughts are profound and spiritual, but I've also used that time for moments in which I find myself thinking things like "I'm thankful for indoor plumbing" or "I'm thankful for potato chips." I find myself in a place where I can celebrate profound truths and simple pleasures from day to day, without feeling a need to impose a hierarchy of value. Life is beautiful in its expansive profundity, sure. But it's also beautiful and meaningful and worthy of notice in the fleeting little moments that can't ever be fully recaptured. So we welcome you to join us. Even if you choose to participate without telling us, or on a different schedule than ours, we welcome you. And chances are, if you're reading this, you've been the subject of our gratitude at some point anyway. Thank for for reading this, but more importantly, thank you for being part of our lives. Jon and I share 11:17 and try to text each other at that time. am and/or pm. It represents the middle date between our birthdays. I am always thankful for him and I am thankful that I have him back in my life. And I am always thankful for the Smiffs. No doubt about it. Thank you for sharing this....setting my Fitbit now. I have so much to be grateful for.. Thank you for sharing this idea. I love the thought behind it and the practicality of using technology this way to remind us to pause and appreciate the small moments and small successes in our lives. I am going to share this with my husband and hope to start together. Great story. We Torgs had a good laugh about Caleb having a friend who sets an alarm and Matt announcing it was him around the campfire. I am a regular listener to the Tony Kornheiser podcast, and he's a big numbers guy. He has a special fascination of great license plates. He calls his son upon seeing them so he can tell him the numbers. Thanks for the smiles this post gave our family!